This fellowship has greatly improved my intellectual development and capacity building as well as provided opportunities for collaboration and networking. CIRCLE has done me a great favour by making the program my first international research experience. The workshop/training organized by CIRCLE between 10 and 13th February, 2016 was very educative, motivating and a stepping stone to help prepare me for my research. I then arrived in Kenya to commence the CIRCLE program on 20th January, 2016 and was very pleased to be assigned my research supervisor, Prof. Shem O. Wandiga, who has provided me with wide-ranging support throughout my fellowship. I was able to tackle my CIRCLE research based on personal knowledge, cognitive abilities and techniques with adequate supervision of my supervisor and mentor. The main focus of the research was to extract lignocellulosic (pure) material from two agricultural residues; palm fruit fibre and physic nut (Jatropha curcas) and convert to useful energy and chemical feedstock that is biofuel and feedstock for industrial use. Currently, at my field sites (Aranyin Village, at the oil palm processing centre and physic nut plantation site, near Ogbomoso, Nigeria) the residues are dumped near the processing centres because there is no technology for the villagers to process it further. For my research I obtained the lignocellullosic materials from the residues and pyrolysed at low pressure at selected temperatures to determine the optimum level. Then bio-oil was extracted for each residue and further analysis was carried out using GC-MS machine in order to determine different components in each sample residue. 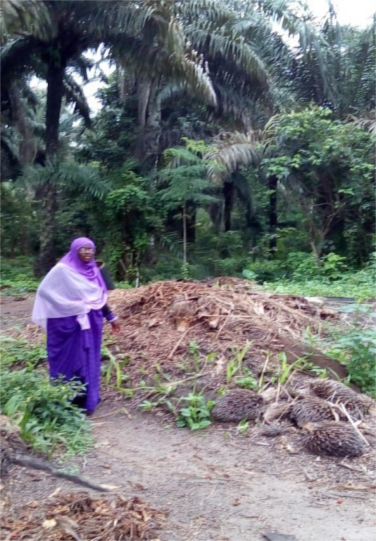 The analysis found that the density, viscosity and calorific values of the palm and physic residue oil were comparable to other common fuels such as, gasoline, diesel, ethanol, wood, coal and natural gas. This indicates that bio-oil from the residues is a potential source of energy and can be upgraded for use as fuel. Aromatic oxygenated and hydrocarbon compounds are major dominant compounds in the palm fruit fibre oil and physic nut shell oil is rich in aromatic ethers, cyclic ethers, secondary amides and organic halogen compounds which are also important feedstock useful for industrial purposes. When residues are burnt, bio fuels and chemical compounds are released into the atmosphere causing air pollution, contributing to global warming. It is therefore both profitable and highly beneficial if energy and chemicals can be produced from them rather causing environmental pollution. In this framework, climate stewardship becomes a partnership between the public, higher education and the government. To implement the findings, it is important that representatives of the relevant stakeholder groups separately deliberate on a new system of proper disposal of residues and renewable technology relevant to climate policy. This could then move to a symposium and workshops which bring various ideas from different groups together to embark on technology that is environmental friendly and to develop strategies or policies for combatting climate change. 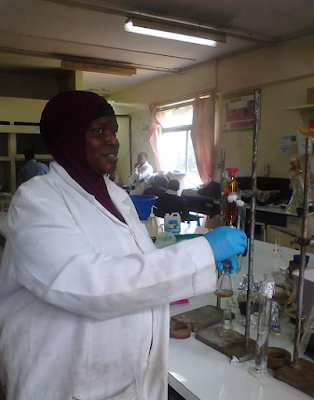 I have presented the results of my research at the “East and Southern Africa Environmental/ANALYTICAL Chemistry Conference (ESAECC), The “11th Theoretical Chemistry Conference in Africa (TCCA)" 2016 in Mombasa, Kenya and "Roles of Higher Institutions on Climate Change”, held at Manchester Metropolitan University, UK. I was also able to attend the ACU conference of university leaders in Accra, Ghana, in July and while in the UK I took advantage of the opportunity to meet my specialist advisor (Prof. Patricia Harvey) at University of Greenwich, Kent, UK where I presented my research work at her departmental seminar room. The experience in the bio-oil technology has been a worthwhile and enriching one. These skills have led to further training on bio-gas production from animal dung; “Bio-gas Production Technology” at the University of Nairobi, Kenya. I acknowledge Almighty God for the privilege and safe trips through out. My appreciation goes to my Supervisor on this program, and financial support of the CIRCLE programme, which has contributed immensely on the achievement of the work. My profound gratitude goes to LAUTECH, Ogbomoso for releasing me and the University of Nairobi for providing research facilities. 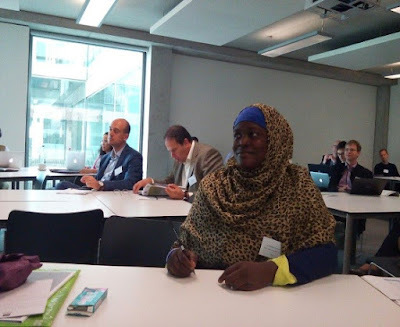 I really appreciate the CIRCLE management team for supporting my attendance at the Climate Change Symposium at Manchester Metropolitan University, UK. Indeed, my skills in technology for renewable energy and my capacity in Climate Change research have improved tremendously through this fellowship. Long live the CIRCLE fellowship, ACU, AAS and Vitae!!!! Wonderful work Dr.Bola, hopefully these alternative sources of Energy will be seriously considered in the near future.